As the audience for a high-school comedy that presents detailed debates within Marxism is probably limited to, well, me, I guess The Trotsky is the closest we’re likely to get. And it’s a pretty good film, although of course I am disappointed by the limited engagement with the details of Bolshevik theory within the film. The biggest limitation is that no-one in the film seems to have any conception of anything left of liberalism, union representation and some kind of fuzzy humanitarian conception of “social justice.” Nonetheless, the adding of even the trappings of socialist politics to a high-school film is entertaining, and there are various minor moments in the film that are interesting. The film concerns a Montreal teenager, Leon Bronstein, who, discovering that he has the same name as Trotsky, comes to the conclusion that he is the reincarnation of Trotsky, which he interprets as meaning that his life will follow Trotsky’s in quite some detail. 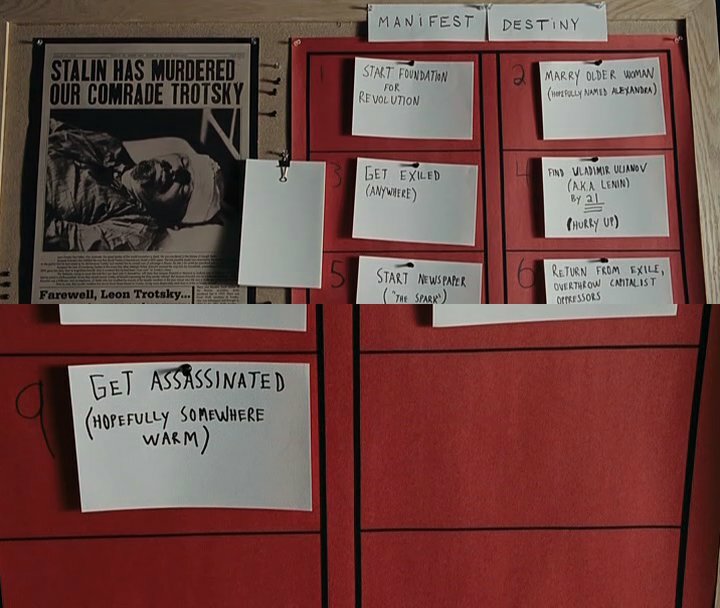 What’s interesting is how the film shows Leon responding to this destiny: he takes it as an opportunity to throw himself into the role of Trotsky completely, even though, as we see at the beginning of the film, he believes this means he will eventually be assassinated and, as we see at the end of the film, he believes the relationship to which he is at that point completely committed (as a result of fortuitously meeting an older woman with the same name as Trotsky’s first wife) will inevitably end fairly soon. I was hoping this would be taken as a springboard for a discussion of the role of determinism within Marxism, particularly as this is a particular point of tension within Bolshevik theory. It would have been great if the film had ended with Leon discovering that, as his own historical moment is different from Trotsky’s, his life, even as a reincarnation of Trotsky’s, would necessarily be different, that is, with him discovering that the theory of permanent revolution applied to his own life. Still, the way Leon responds to determinism with activity rather than fatalism is a genuinely charming feature of the character, and I think is part of what makes the performance, which could easily be caricature, quite sympathetic. The other interesting theme that pops up in a few points in the film is Leon’s defense of boredom.